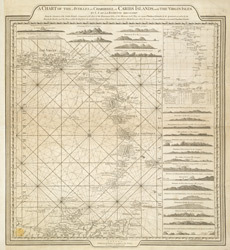 This chart by cartographer L. S. de la Rochette (1731 ? 1802) was engraved by William Palmer and published by 'geographer to the King' William Faden in 1784. There is a compass rose at the centre of a network of rhumb lines (for sailing directions) and a smaller scale map of the region is inset at top right showing distances between the islands, sailing routes and a table recording latitude and longitude of each island. Down the right side of the map are represented the profiles of the headlands of the different islands- this is as they would appear to sailors from the sea.